Most computer experts agree, it’s it’s not good to keep your desktop cluttered with files for an extended period of time. Files sitting directly on your desktop can slow down your computer and keep you disorganized. That’s why applications like Hazel and Declutter can be very useful in helping manage files and folders. For years I have used a Hazel folder rule to automatically move or delete image files from desktop after a designated period of time. The rule mainly moves image files to my Junk folder just in case I need to retrieve one or more of them. But after a set period of time, there’s another Hazel rule to move old files in my Junk folder to the trash. Here’s a screen shot of the desktop folder rule. If you want to know more about Hazel, check my articles introducing the application. 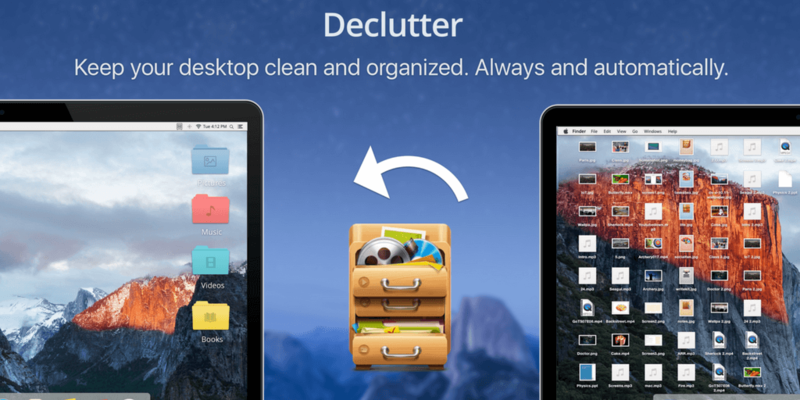 DeClutter is $9.99 in the Mac App Store. For those who don’t need an advanced application like Hazel, you might want to use a similar program called Declutter. 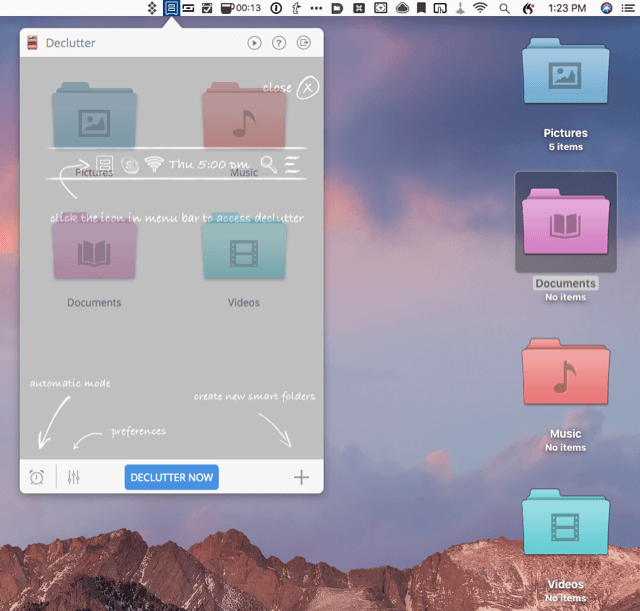 If you’re the type of Mac user who insist upon having your files on your desktop, Declutter will at least keep them organized in files you set up. 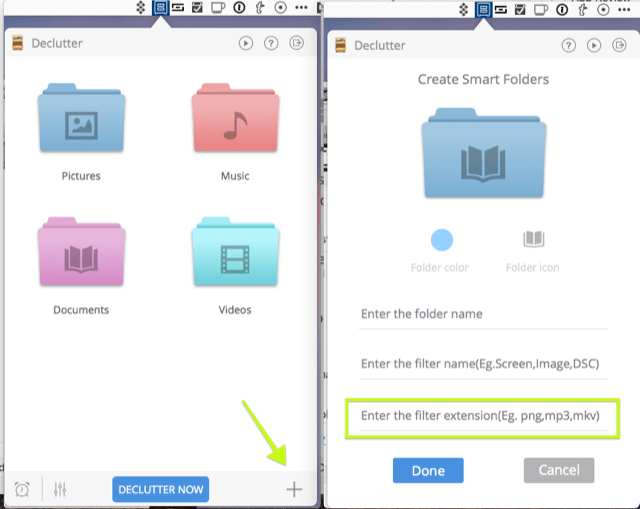 After you download Declutter, it will need to allow it place a set of default folders on your desktop. The folder can only be place on the Desktop, so you’re just giving Declutter permission to do that. A default set of nicely designed folders will added to your desktop with the rules already set up for you. 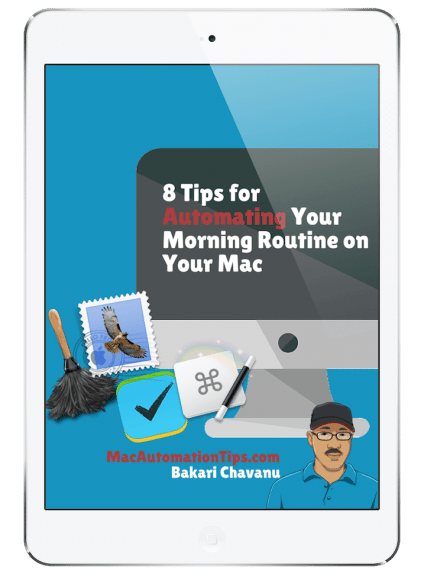 You access Declutter from the menu bar in which the initial window provides instructions for how to use it. 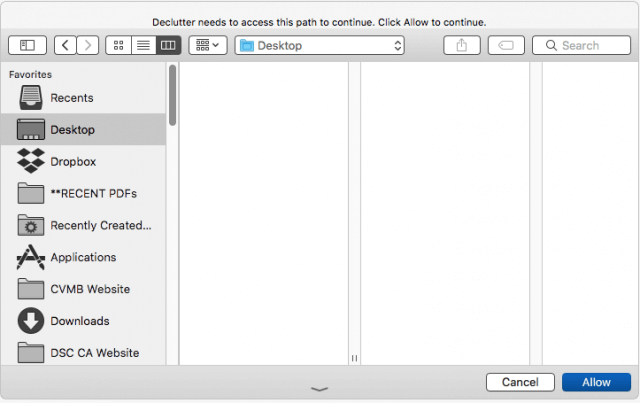 If you already have files on your desktop, you can simply click the Declutter Now button and it will move those existing files to designated folders. To see how Declutter rules are set up, click on the Declutter icon in the menu bar and then click on one of the folders. Basically the Declutter rule for the Pictures folder is set up to capture image files with the extension, jpg., png, bmp. You can add other extensions for the files you work with. Similarly, the Movies folder captures files with the extension, mp4, mkv, mov, avi, etc. 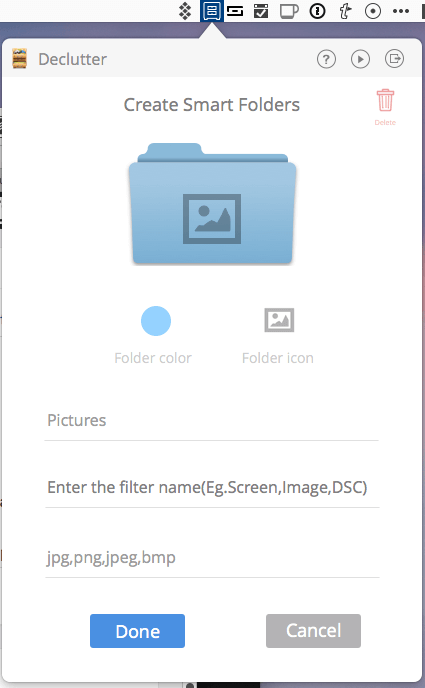 Notice you can change the icon and color for the folder, and you can drag files you don’t want to use to the trash. You can easily create your own capture folders by clicking on the + button and then adding the folder name, and description and file extensions you want to capture. Maybe you want to set up a separate folder for capturing on .mov files. 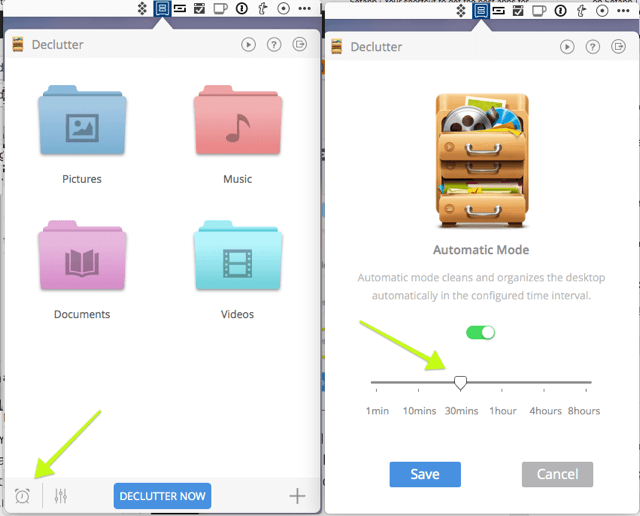 Now for the purposes of automation, Declutter will automatically move files on your desktop to the designated folders based on the time you set. This is similar to Hazel rule set up, though Hazel provides some advanced options. Because Declutter also allows an hotkey to be assigned for triggering the Declutter button to, that means you can also map the hotkey to a BetterTouchTool finger gesture or even create an Alfred workflow that allows you to type a keyword to trigger the assigned hotkey. Using a finger gesture or typing a keyword can often be faster than dragging your cursor to your menu bar. Or you can just allow Declutter to automatically clean up your desktop at a set time interval. 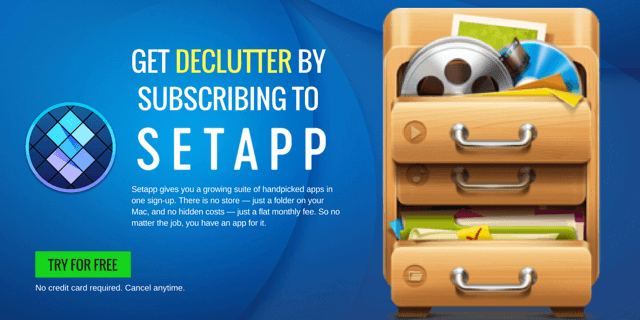 You can try out Setapp for a free 7-day trial, which means you can not only try out Declutter for seven days, but there over a hundred other apps you can download and try out as well. You don’t have to provide a credit card to register for Setapp. 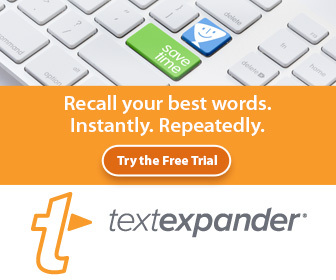 At the end of your trial, you can sign up for a $9.99 subscription, which gives you access to Declutter and all the applications in the suite. More applications get added to Setapp on a regular basis. If you purchase 10 of the applications separately outside the Setapp suite, you’d easily pay over a hundred dollars, but with the subscription, you pay less over time. 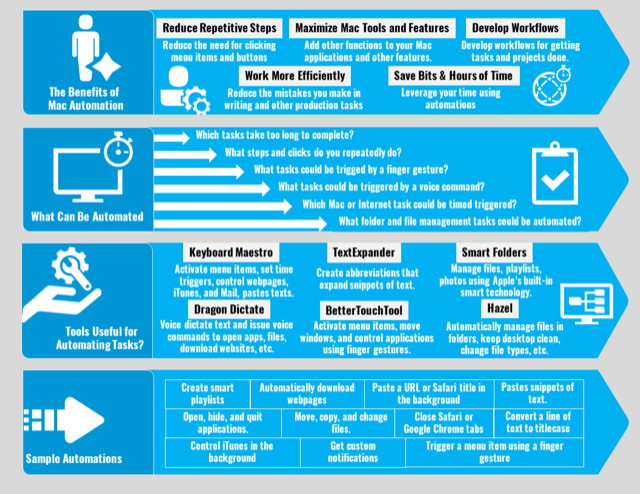 Let me know what you think of Setapp and Declutter.